For this column, my 61st for the American College of Physicians (ACP), I thought it would be interesting to look back at the first 60 and review the trends and topics that inspired me to write 800 to 900 words every month. Rather than scan the titles or reread the whole collection, I used a website named Voyant Tools to analyze the text of all of my posts and create a word cloud based on the number of times specific words appeared in the entire series. Before running the application, I blocked several recurring words, such as my name, the organization’s name, and most of the words in the monthly disclaimer. The resulting word cloud appears below. The first revelation from the word cloud, and the one that made me proudest, was the prominence of the words “patient” and “patients.” I was happy because that this was not by design, as is often the case when someone in the room says “we need to include something about patients,” almost as an afterthought or an exercise in political correctness. The fact that patients were mentioned frequently in my articles should not be surprising, because while many of my columns were about the plight of the practicing physician, they were also about how the care (another frequently-used word) that we provide to patients is affected by what we do in our practices and what is done to us by people and institutions outside our practices. 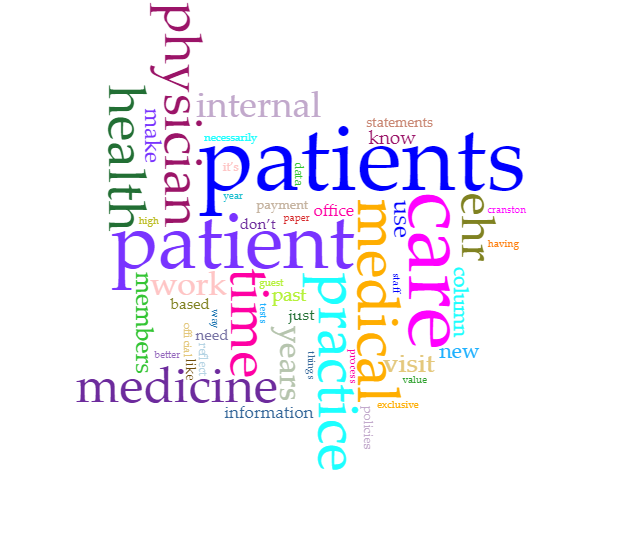 I was not surprised to see two other words jump out in the word cloud: “time” and “ehr.” Many of my posts touched upon the effects of not having enough time to do meaningful work for our patients and the impact on professional satisfaction. Administrative burdens such as prior authorization, doctor’s notes, data entry for performance measurement, and, of course, electronic health records (EHRs) gave me plenty to write about. EHRs were the topic of my very first column, written as a “report card” that rated several areas of EHR use. My plan was to make this a recurring column. I wrote a follow up report card column two years later, but gave up after that, because very little changed. That correlated with the experiences of most EHR users. One EHR related column was on the potential and pitfalls of patient portals. How EHRs changed the language of documentation to something other than English was the subject of another post. “Practice” and “practices” were two words that I used often, probably because many of my articles were about my own practice and how it transformed over the years, to a great extent the result of ACP’s initiatives. I expected to see “PCMH” in the word cloud, but it wasn’t there. While I did not use that term frequently enough to make the cut, I described its features as well as which ones worked well and which ones needed work in many of my columns. In case you haven’t figured it out by now, the reason for this retrospective is that this is my final submission as the monthly contributor for ACP to KevinMD. When I accepted this role in the spring of 2012, it was to be a 12-month assignment. I guess both ACP and I lost track of time. The goal of the “ACP on KevinMD” column is to present different perspectives on topics that ACP members might find of interest, in a forum outside of the “official” College publications. Having the same author for over five years doesn’t seem consistent with presenting different perspectives, so it is time for someone else to take over. No last column would be complete without a few acknowledgements. First, I would like to thank Steve Majewski of the ACP Public Relations staff, who proofread my columns better than the grammar and spell checker in Word ever could, plus he came up with the titles for the columns (some of which survived Kevin Pho, though most did not). All of my columns underwent final review by the College’s EVP/CEO, who was Steve Weinberger, MD, MACP for most of my tenure, and Darilyn Moyer, MD, FACP for the past year. I always appreciated their prompt attention to my final drafts, given how busy they were, and was inspired by their enthusiastic support for my writing. I also thank Kevin Pho for including this column in his influential blog and helping to get my (and ACP’s) word out. Finally, and most importantly, I am grateful to ACP for giving me this amazing opportunity to have a monthly conversation with thousands of people about so many important subjects. I look forward to reading future columns from ACP’s next contributor. One of my personal goals for the column was to counter the “binary thinking” that has divided our society, including, sadly, our profession. Whether the topic is professional satisfaction, payment reform, practice transformation, EHRs, or even maintenance of certification, if all we do is take sides instead of analyzing issues, trying to understand why things work or don’t work, and developing solutions, then we will squander our ability to rise above the challenges that we face as medical professionals. I hope that I have given readers something to think about over these five years, while reducing that polarization. Yul Ejnes is an internal medicine physician and a past chair, board of regents, American College of Physicians. His statements do not necessarily reflect official policies of ACP. Feel over-boarded by MOC? Fight back.